When it comes to starting an online store, picking the right e-commerce platform should be the first priority of every retailer. While it is important to consider user-friendliness, functionality, and features of the platform, you must ensure that it meets your business requirements as well. Each e-commerce business has a different set of audience to cater to. It means that if you want to improve your online sales and stay ahead of the competition, you need to build customer-centric e-commerce websites. This can be achieved by choosing the most suitable e-commerce platform, which best suits your business requirements. However, many retailers struggle to differentiate between different e-commerce platforms and find the right one for their business. If you belong to the same category, continue reading. In the following blog post, we are going to share an insight into different e-commerce platforms, along with their pros and cons. What is an E-commerce platform and Why Do You Need It? If you aren’t familiar with e-commerce platforms, here’s what you need to know. An e-commerce platform is a software which helps retailers build an e-commerce website for their business. Not only can retailers set up their online stores, but e-commerce platform also helps in tracking sales, optimizing the website for search engines, and adding elements which make the website extremely customer-centric. You can consider the e-commerce platforms as one-stop shops to build an online store. However, it is worth noting that every e-commerce platform is designed to cater to different requirements of different users. For instance, Shopify is the perfect platform for small-businesses while Magento can be used to build scalable e-commerce stores for any business, be it small or well-established. Therefore, it becomes extremely crucial to choose the right platform for your e-commerce website. Now, that you the importance of having an e-commerce platform, let’s take a look at some of the best platforms which are being preferred by the majority of retailers. Magento is one of the most powerful e-commerce platforms in the market. It is written in PHP and is open-source at the same time. This is the reason why the majority of e-commerce developers prefer Magento over any other platform, especially when we’re talking about building highly scalable online stores. Furthermore, being open source, the developers have the freedom to modify and tweak the design of their store to build customized websites, which cater to the requirements of customers. An online study has suggested that 250,000 e-commerce websites are running on Magento itself. Whether you own a small or well-established retail business, Magento is the right option to pick. 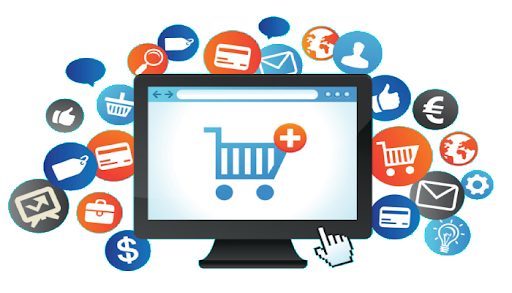 Being highly Scalable, developers can build an e-commerce website for any business. Optimize the website to make it search engine friendly. Open Source offers easy customization options. Large Community of Retailers and Professional Developers. Freedom to Choose any Hosting. Requires expertise. Novice retailers may not feel comfortable with the interface. Even though Magento is free, the enterprise version is highly expensive. Unlike Magento, Shopify is for retailers who want to keep things simple while integrating the best features in their online store. Shopify doesn’t require the retailer to have any technical expertise. As long as you know where you want to place each element on your website, you’re good to go. All you have to do is drag and drop these elements and set up the entire store without experiencing any sort of hassle. However, if you own a large scale business with thousands of products, Shopify may not be the most optimal solution as per your business model. We recommend using Shopify if you’re just starting out with your e-commerce website and only have a few products to sell or if you’re only planning to target the local audience. Easy to Set Up & User-Friendly. Easy Learning Curve makes it perfect for beginners. Perfect for Small Businesses catering to the local audience. SEO-Friendly to make the website search engine friendly. Highly Expensive. Even the basic version costs $29/month. One cannot use third-party hosting, making it even costlier. Like Shopify, BigCommerce is also a paid e-commerce platform. However, it doesn’t have an expensive price tag, which makes it the perfect option even for small retailers. Furthermore, BigCommerce has a user-friendly interface and even a person having no technical knowledge can use it to build a customized e-commerce store. BigCommerce also has flexible APIs which means it still offers better customization options than Shopify. Along with this, you can also integrate other leading e-commerce stores like Amazon and eBay to offer an exceptional shopping experience to the customers. Integration with Facebook, Amazon, and eBay. WooCommerce, unlike the previous three platforms, isn’t an e-commerce platform, in general. It is a plugin for WordPress which turns your website into an e-commerce store. Like WordPress, WooCommerce is also open source and free of cost. Running on WordPress, it becomes extremely easy to make the entire website search-engine friendly. Better content marketing is yet another benefit of building an e-commerce store using WooCommerce. Basically, if you’re a WordPress user and are comfortable with its interface, WooCommerce is the most suitable option for you. Perfect Option for WordPress users. Cannot be used on third-party CMS, except for WordPress. Squarespace Commerce is the e-commerce platform designed by the leading SaaS based content management system (CMS), Squarespace. Ease of use and user-friendliness are the two major key-features of SquareSpace commerce. The platform is stacked with a wide range of elements and widgets which help you build customized e-commerce stores. If you’re looking for a decent e-commerce platform with advanced functionality and easy learning curve, Squarespace Commerce is your answer. Let’s take a look at some of its pros and cons. Wide Range of Templates and Designs. Not a suitable option for large-scale businesses. Unlike WordPress, Squarespace doesn’t support third-party plugins and extensions. OpenCart is an e-commerce platform having a collection of several extensions. A community of professional developers continuously work on these extensions and release thousands of themes as well. It means the customization options for Opencart are comparatively more than Squarespace as well as BigCommerce. Easy to Set Up the Online Store. Easy Learning Curve & Beginner Friendly. OpenCart is not SEO-friendly unless you install SEO plugins. Customization is certainly not easy in OpenCart. PrestaShop is an open-source e-commerce platform, which is supporting more than 200,000 e-commerce websites across the globe. Like Magento, PrestaShop is also a customizable platform which can be used to build sales-oriented e-commerce stores. However, PrestaShop is a self-hosted platform. It means that you cannot use any third-party hosting, which can make it a little more expensive than Magento. Furthermore, the premium version of Prestashop is expensive as well. If you are looking for an open-source e-commerce platform, we would recommend picking Magento over Prestashop. Open Source and East to Customize. Choosing the right e-commerce platform for your business is highly imperative. Most of the e-commerce stores are likely to expand in the future, and therefore, it is crucial that you pick a platform which offers high scalability and can support even hundreds of product pages. Share your business requirements with our professional ecommerce developers and let them choose the most suitable e-commerce platform as per your business requirements.